About connecting the television with speakers of a stereo receiver or home theater system. 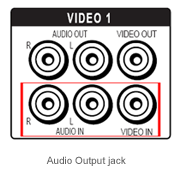 Please follow these steps when connecting the Audio Output jack of a television to the stereo receiver or home theater system. Connect a composite audio cable to the Audio Output jack of the television. Connect the other end of the composite audio cable to an Audio Input jack on the stereo receiver or home theater system. Note: Depending on the stereo receiver or home theater system being used, the audio input may be labeled TV INPUT or VIDEO INPUT. Set the television to the desired setting of either Fixed or Variable. Turn on the stereo receiver or home theater system. Set the stereo receiver or home theater system to the proper input. Follow these steps to connect the Audio Output jack of a cable or satellite set-top box to a stereo receiver or home theater system. Connect a composite audio cable to the Audio Output jack of the set-top box. Connect a composite video cable to the video output of the set-top box. Connect the other end of the composite video cable to the video input of the television. Set the television to the proper video input. Set the stereo receiver or home theater system to the proper mode. Note: Although there may be other methods, the two methods provided above are the most common scenarios. For model-specific information about other possible connections and system settings, refer to the operating instructions supplied with the product.